Compound and polish in one easy to use product! The Meguiar's Marine/RV One Step Compound 67 will remove medium to heavy surface imperfections, while finishing down like a premium finishing polish! One Step is an aggressive cutting compound, that quickly removes heavy oxidation, hard water spots, scratches, waterline scum stains, faded gel-coated, fuel stains, exhaust stains, etc. The surface will look extra smooth and clean upon completion. In the past you would have to follow up with a finishing polish, but the #67 you can save yourself time and effort by combining steps. On top of removing imperfections, #67 will finish the surface down, restoring it with a smooth, high gloss finish. Apply the One Step Compound by hand or via buffer for best results. After you apply this product protect the surface with a quality sealant or wax. 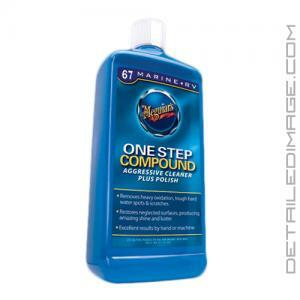 If you are looking to combine multiple polishing steps, the Meguiar's Marine/RV One Step Compound 67 is for you. Afterward you'll stare at your boat and love the shine! Removes heavy oxidation, tough water spots and scratches. One Step Compound is specially designed to both clean the gel coat surface and leave behind a high gloss finish. It will remove moderate to heavy oxidation, tough hard water spots, stains and light to medium scratches. Thus restoring the color and leaving a rich gloss on the treated surface. Excellent results by hand or machine. Meguiar's compound reduces the steps to treating neglected surfaces by creating a compound and polish in one! DIRECTIONS FOR MACHINE USE: SHAKE WELL. Always apply on a cool surface. Working one section at a time, dispense product on a clean surface. Wipe off splatter immediately. (When working with a new buffing pad apply a small amount of the product in the shape of an "X" on the pad itself). Do not apply to vinyl or rubber vinyl or rubber surfaces. Using moderate pressure on the buffer spread the product evenly over the surface with overlapping movements to ensure uniform coverage. Work product until nearly dry. Immediately wipe dry with a separate clean towel or Meguiar's Ultimate Wipe (M9910). (For best results, use a high-speed rotary buffer with a Meguiar's Mirror Glaze Cutting pad). DIRECTIONS FOR USE BY HAND: SHAKE WELL. Always apply on a cool surface. Working one section at a time, dispense a small amount of product on a 100% cotton, terry cloth towel or applicator pad and rub thoroughly into surface. Immediately wipe dry with a separate clean towel or microfiber. Do not let product dry on surface. TIPS:Meguiar's 67 One Step Compound will feed the gel coat with essential oils and generate a rich gloss. For long-lasting protection, follow with Meguiar's No. 56 Marine/RV Pure Wax. This stuff works amazing on aluminum car haulers! All in one, works great! Works great, I just did a Boat that the paint had a lot of oxidation and it brought the paint back to life.